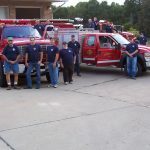 The Deerwalk VFD was started by a group of dedicated citizens living in the unincorporated communities of Deerwalk and Dallison in eastern Wood County, WV. Other from around the area also attended the organizational meetings. The organizational meetings were held prior to the actual operational start up of the department in the local community building. The community building originally was the Hackett Country Store which had to be moved for the new intersection of State Rt. 31and US Rt. 50 a four lane highway which was built between Parkersburg and Clarksburg, WV. It used to be located beside the Hackett home and across the road from the Elmer and Norma Marshall residence. As a result of those meetings the Deerwalk VFD was incorporated on Oct. 4, 1976.